Maize is the most widely produced crop in South Africa, grown extensively in the Free state, Mpumalanga, and the North West as well as most other provinces but in smaller expanses. In this country, we rely on maize as our staple diet. It is a commodity which forms a large part of our economy which is why we need to look after it carefully. This can prove challenging sometimes as nature likes to throw a curve ball occasionally. All living organisms have enemies, even the maize plant. We need to learn how to defend our crops against these enemies to the best of our abilities. In this article, we will briefly outline the challenges of dealing with Stalk borer in our maize crops. The best method to identify whether there is a Stalk borer infestation in your maize, is to scout and inspect your land. Try and scout in a grid pattern to get an overall picture of the field. Once you have finished scouting the field you should try and quantify the damage into a percentage which will help you determine if it would make economic sense to spray a chemical control measure. How do you look for Stalk borer infestations? A farmer can pick up evidence on the maize from as early as three weeks. The most prominent sign to look for is holes on the leaves in perfect formation. This is referred to as ‘shotgun’ damage. As their name suggest the caterpillars feed primarily in the stalk of the maize plant. At tasselling stage the caterpillars do also sometimes drop on to the maize cob and feed on the cob itself or at the base of the ear. If this is the case a farmer can sometimes pick up premature fallen ears of maize, cutting of the energy supply to the ear of maize. Another method of identifying infestations is to look for the physical caterpillars in the plants. One can walk through the field at night and identify weather there are small grey and white moths present. The grey moth is the male and the white moth is the female. Moths fly at night and lay their eggs on maize plants between the leaf sheath and the stem on the youngest fully unfolded leaf. Eggs hatch into caterpillars, which move into the growing points, where they start to feed. Once the farmer has determined that there is in fact a bad infestation of stalk borer in his maize crop (usually over 10% of plants) he will need to determine a plan of action. The primary method of control is by chemical application. The farmer will use an insecticide intended for control of stalk borer and broadcast it by using a boom spray. Before the farmer applies the chemical, he should be sure of the exact purpose of the chemical as not all poisons are the same. Some work on direct contact and others are systemic poisons which aim to kill larvae in the leaves and in the stems of the maize plant. Remember that all poisons are dangerous and should be handled with extreme caution and care. Wear gloves, a face mask and protective glasses when dealing with any chemical. Modern agriculture has made huge advances in cultivar development. Some maize cultivars have now been genetically modified to withstand infestations of Stalk borer. This is a big help to the farmer in controlling pests. It does however come at a price. GM maize seed cost considerably more than standard non-GM seed. When planting, standard maize seed the best method of prevention is being proactive. Scout your fields regularly to inspect for infestations of Stalk borer and take quick action when you identify a problem. 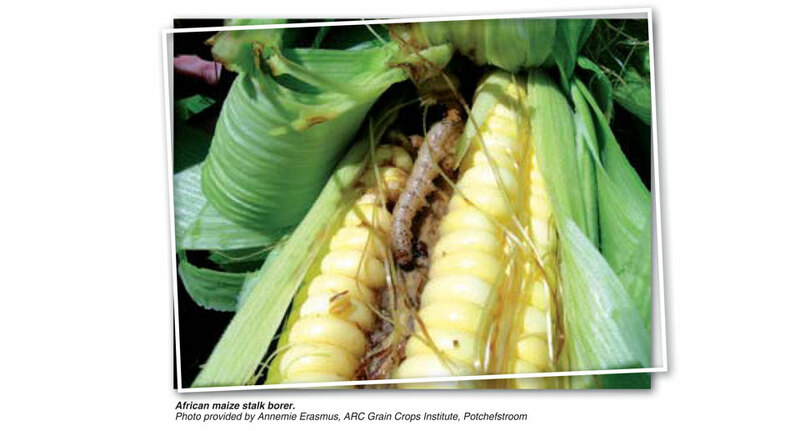 Remember that Stalk borer and other insects have the potential to destroy thousands of Rand’s worth of your crop. So, don’t sit idle. Make sure that you are always aware of what is going on in your field.